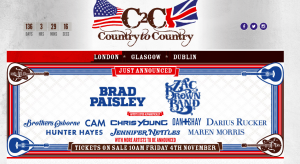 Organisers of the C2C festival have announced the first wave of artists for next year’s event and already it’s split those on Facebook groups who have been waiting for the names. The main criticism seems to be that some of the acts who will be playing, particularly those who seem to be the headliners, have played C2C before, namely Brad Paisley and Zac Brown Band. Other acts named in the first wave include who haven’t been to C2C before, including Chris Young and Jennifer Nettles. So do the folk who are not happy have a reason to be upset? Well I’ve seen Paisley and Zac Brown and they are great performers and certainly worth seeing. I think it’s also worth saying that many of the people who will buy tickets won’t have seen many, or possibly, any of the acts. I imagine that the organisers are keen to keep the line-up as fresh as possible, while also trying and get current big names and not ignoring people who have played C2C before and are still a big draw. There is also a lot of competition for the big US acts from the many festivals in the States, as well as concert tour programme which the big names are committed to. Plus, the festival has gradually grown since it was first launched in 2013 and is now four days, so the organisers now have to fill a bigger programme, though the continuing success and growth in attendance must mean the organisers have to attract more acts. So, the reaction to the line-up seems to prove that you can’t please all the people all of the time. Plus, there are still more names to come in 14 days time! C2C 2017 is March 9, 10, 11 and 12. Tickets go on sale at 10am on November 4.